Blog - Showcase Builders, LLC. We’ve all received advice on how we could make things better in our home. Sometimes it’s advice on how to clean, and sometimes it’s advice on things much bigger such as renovations. Unfortunately, it’s not all good advice. Here are five pieces of advice that you should NEVER listen to! Your granite (or marble or limestone) countertops are virtually indestructible. WRONG! They are strong, but not indestructible. Marble is especially fragile and very porous making it susceptible to liquids sinking into their surfaces. (Think red wine or purple Kool-Aid on your countertops…forever.) You must be quick to clean those spills to keep the liquids from forever changing that beautiful countertop you love so much. Additionally, all rocks will break if hit hard enough. Be careful with heavy objects landing near edges on any of your countertops to avoid chips and scratches. Also, be aware of acidic liquids and foods which can stain or cause etching, or dullness, on your stone countertops. Clean your garbage disposal with lemons. Wrong again! While it does make your garbage disposal smell clean, the acid from the lemons can corrode the metal parts of your disposal. If you’ve been told that coffee grounds are the next best thing, think again. They may be great at getting the gunk off the blades without causing corrosion, but they can accumulate in your pipes causing them to clog. The best cleaner you can use is the age-old cleaner many of us know – baking soda. Your bank account, and your septic tank if you have one, will thank you! A trendy kitchen remodel will increase the value of my home. Be careful here! How many of us remember the avocado green and mustard yellow kitchen appliances from the 50’s? Exactly. Trends are just that…trends. They will eventually go out of style. The easiest way to have a trendy remodel without breaking the bank is to use trendy paint colors. Then select the timeless updates like shaker cabinets, subway tile, and wood floors which, by the way, have never gone out of style. Paint hides everything. No, it doesn’t. If there are any dings in the drywall, any signs of mold, or any termite damage, you’ll need to fix the problem before painting over it. Otherwise, it’s like using gum to plug a hole in a dam. The problem will still be there and could get worse if not addressed. Wallpaper works anywhere. No, wallpaper does not work anywhere. Wallpaper is one of those trends that has come and gone and come back again. When used in the right space, it can give a room the perfect touch. However, be careful where you put the wallpaper. If used in the wrong room, it may be prone to fading or condensation. Also, try to pick a style you think you’ll love for years to come. Because once you’ve put in the work to get your wallpaper in the perfect spot, you won’t be looking forward to removing it and replacing it anytime soon. If you have a septic system, it’s important to watch for signs of trouble. Here are some hints for troubleshooting some of the issues that may arise with your system. Wastewater treatment is essential to protecting our fresh water sources, and statistics from the US Environmental Protection Agency show that more than 20% of households in the US depend on septic systems to treat their wastewater. Septic systems that are properly maintained can provide excellent wastewater treatment which is not only cost effective but will also help preserve water resources. Pantone’s Color of the Year selection has been influencing decorating styles for many years. In fact, many manufacturers and fashion buyers wait for this announcement each year to begin their purchasing for the next year. 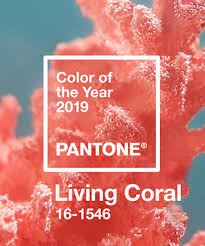 Just this week, Pantone released the Color of the Year for 2019, 16-1546 Living Coral. It’s described as “an animating and life-affirming coral hue with a golden undertone that energizes and enlivens with a softer edge.” It’s a vibrant color yet still has a warm and comfortable feel. Pantone expressed their desire to choose a color that is found in natural surroundings while also symbolizing both optimism and joy. How do you decorate with the color of the year? 1. Use it as an accent wall. You can place a large piece of art or furniture against the wall to really accent the wall color. When mixed with the right balance of whites and complementary colors, you can get a beautiful harmonized look. Your accent wall doesn’t have to be a solid color, either. Get creative with a design or fun wallpaper pattern in a bathroom. 2. If an accent wall is too bold of a statement, use this color on a piece of furniture or as chic window treatments in a guest room perhaps. Color your built-in cabinets for a large impact in a small room. 3. One of the easiest ways to use the color of the year is to use it in accessories such as art, candles, pillows, etc. You can add a stylish touch to any room with a pop of color here and there. The color selection does not stop there. Pantone offers different palettes to coordinate other colors with their color of the year. Behr also released their 2019 color of the year, Blueprint S470-5, which is a beautiful, soothing color that would be great to complement with Pantone’s Living Coral. We absolutely love stained concrete floors. They are such a stylish choice for indoor floors, and there are so many choices from colors and textures to finishes and decorative overlays giving you the opportunity to have a floor like no other! The best part is they are durable and incredibly easy to clean. Here are a few things you need to know about caring for stained concrete to keep your floors looking amazing for a very long time. One of the great things we get to do while working with a variety of clients, is building for different lifestyles. When they come to us at Showcase Builders, we sit down and specifically ask them what they would like in their new custom-built home if they have not engaged an architect at this point. Knowing their intentions and helping them manifest a lifestyle of their dreams makes our dedicated team smile. It is our great privilege to add many special features for homeowners. In fact, consider this custom home that was among those in the Hill Country Builders Association 2014 Parade of Homes.